Howdy! 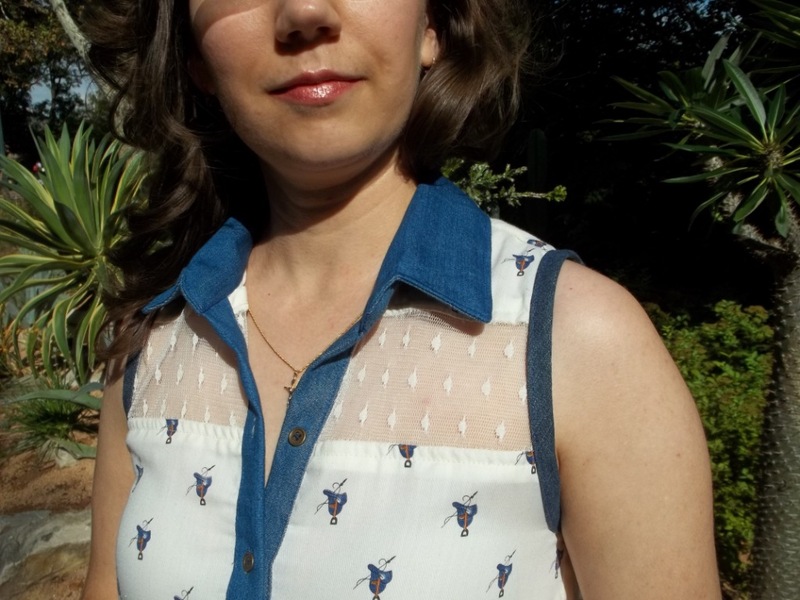 Here’s a loose and comfy western-themed modern shirt, made from a vintage novelty fabric with a little bit of lace, a little bit of denim, and a secretive bit of skin for the sun to shine on. To go with the subtle motif of the shirt, we chose an equally understated western scenery of dry desert cacti and succulent plants. This is the garment of oxymorons – I’m wearing a shirt, just a really long one adapted to almost be a dress, and although it has a collar that comes up around my neck, I’m not all that covered up…my back and chest are showing. The idea associated with a saddle and its gear, along with blue jean material, is one of general rugged toughness, yet there is a good amount of delicate sheer lace to add contrast femininity. A front placket of brass buttons isn’t completely working, actually, and old fabric goes to make something modern. I guess it’s merely a case of “opposites attract” or my enjoyment of making my own clothes…probably both! 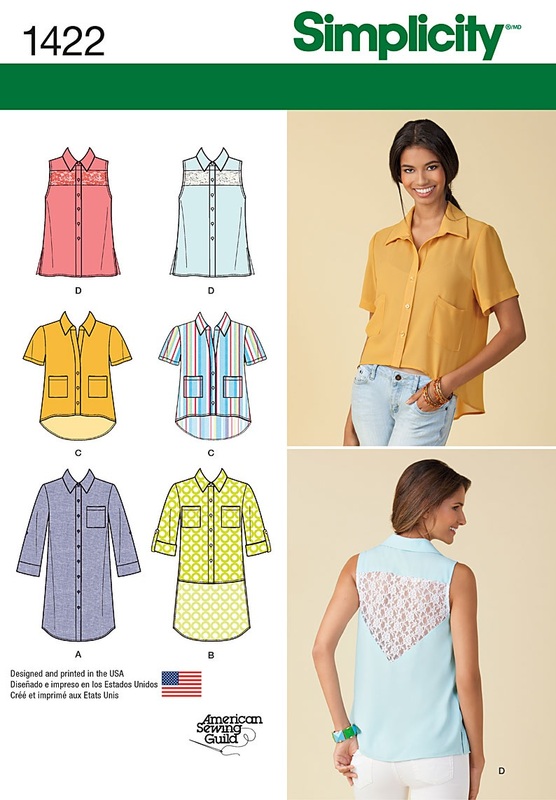 FABRIC: The printed fabric is a vintage cotton/poly blend gabardine, the lace is a poly polka-dot ivory, and the denim is a medium-wash cotton. The denim leftover from my arch-waist 1940’s jeans, the lace came from my untouched stash of laces, and the printed gabardine was bought as a remnant at a vintage market booth. NOTIONS: I had all the interfacing and thread I needed, but after a last minute design idea I had to go out around town and hunt down some denim bias tape in a matching color. The buttons are modern, bought a few years back, and were in my stash of notions. TIME TO COMPLETE: This took maybe 8 to 10 hours and was finished on September 9, 2015. TOTAL COST: I’ m counting the lace and denim as free, so my only cost was the special denim bias tape and the vintage fabric – maybe $8 total. I had as much fun making it as I do wearing it – very much! Wearing a tunic is new to me (yes, believe it or not) so I did have some trouble figuring out how to make this and what to do with it, but now that I feel as if I understand how to make it work. My husband’s workplace was hosting a family “picnic” get together at our town’s zoo, and this was in early fall when the weather here is generally warm, but the breeze and shady spots can become a bit chilly. Thus, my ‘saddle and lace’ tunic was perfect for the day, besides giving me a reason to sew up a fun, new garment for the occasion. Wearing leggings underneath as well as the denim collar around my neck kept me from getting too chilled but the open top half kept me cool enough in the warm sun. It is modern, yet not too edgy nor boring at the same time. Plus it has a level of nice casual wear that I really enjoy. I really need more casual wear like this in my wardrobe. 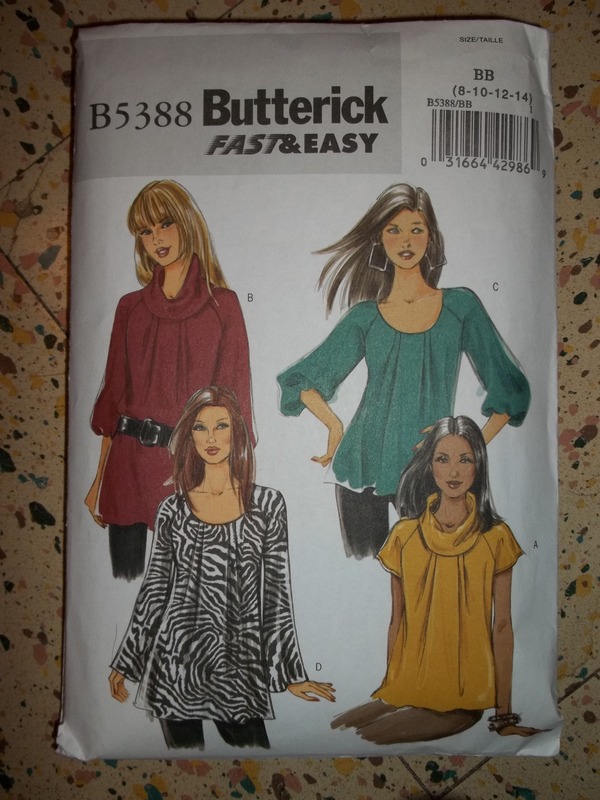 The fit of this pattern’s blouses is generous and but I tend to think the excess ease looks good here. The pattern was easy, and everything fit together very well, but I especially love the all-in-one collar, where the neckline stand and the first button are part of the lapel. I think this designing touch amps up the pattern from interesting and different to quite nice. The overall lengths seem to run quite long in everything – the sleeves, the waistline, and the tunic hem. Slouchy is the key here, anyway, so no problem, after all. I must say my choice of using denim for the button placket was not the best decision, and neither was my choice in buttons, but I made it work. The denim makes the front placket so thick and stiff, besides being quite a challenge to make button holes in and sew through to attach buttons. The buttons are working but it is such an ordeal that wears out my fingers I never bother because the shirt is loose enough it slips on anyway. The bottom band I added prevents my shirt from being fully un-buttoned anyway (the reason for adding the bottom piece along with the further contrast it gives), which is why I think of this as more of a tunic. 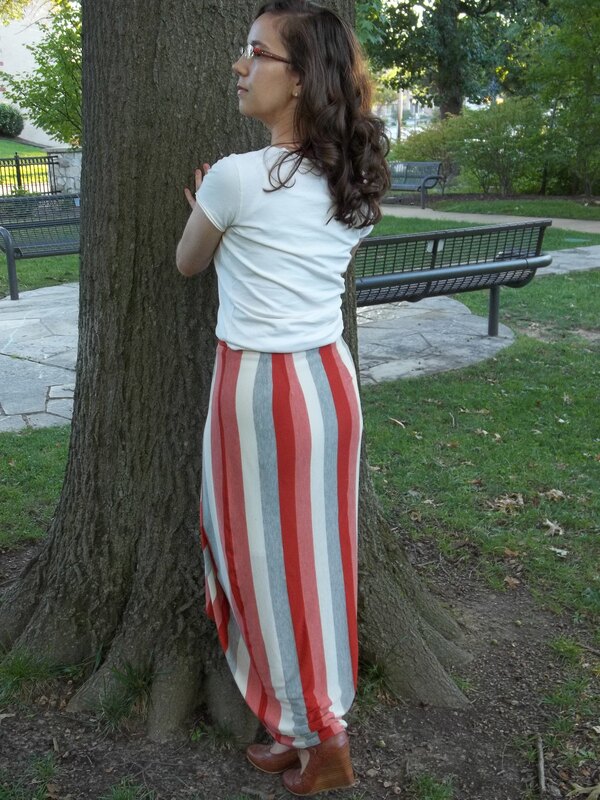 It was either add the contrast or make an arched-side shirt–tail hem, and you can see which of the two I chose. My unusual polka dot lace makes me happy. With a solid or floral version of this shirt, I think a floral lace would work fine. However, floral laces that I had just didn’t look good to me with the novelty print so I pulled out this dotted lace. It’s been in my stash for over 10 years, and I didn’t have that much of it. Working with this soft lace was worse than dealing with silk. It was so slinky and shifty, as well as having crooked lines of polka dots. The shiftiness of the lace was one of the main reasons I realized I needed a stable binding for the armhole edges – more denim. Thinking about it, I coined the print as western, but actually the detail of the print is a bit more about equestrianism, particularly English style. The saddles are drawn quite nice, with a fancy riding whip cross-wise behind it, so it is more like a reference to classy sports riding for show. 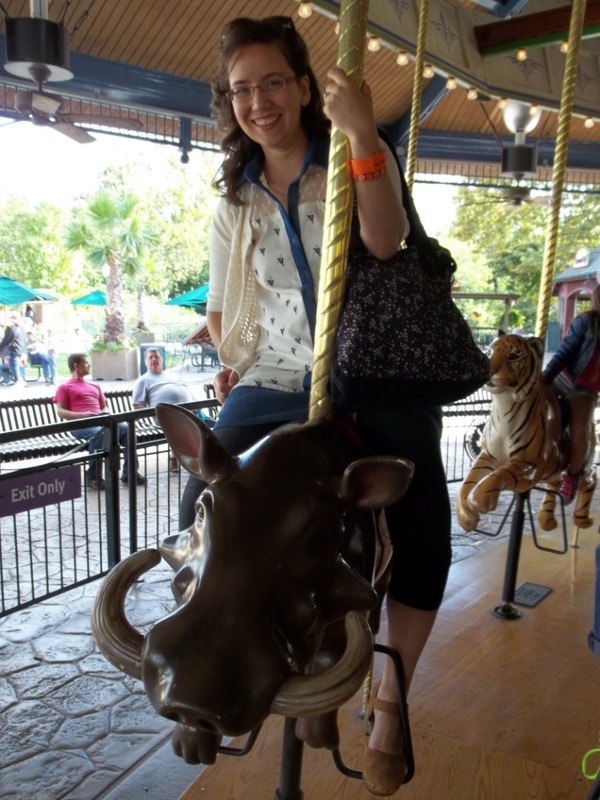 Nevertheless, having saddles and their related gear pictured all over my shirt I couldn’t pass up a chance to ride a wild animal…on the carousel! I chose a warthog and our son rode the giraffe. 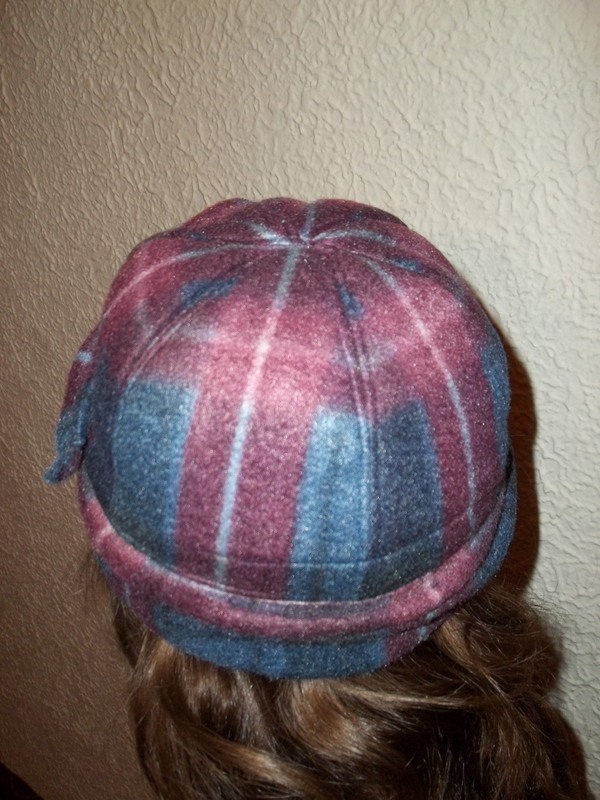 As I mentioned in my previous post, “Putting a Feather in My Hat”, a few years back I had made a basic but successful modern fleece hat which gave me some much needed confidence in hat making. Like I mentioned in that post, I really don’t wear this hat too much, but it does fit and look great. The plaid is matched together perfectly, only it doesn’t match with my wardrobe as often as I would like. Nevertheless, my hat deserves a post sooner rather than later. As you can see, my fleece plaid hat is not very receptive towards any special hairstyle or fixed up coiffure. It has a basic “skull cap” design and a long scarf-like piece that gets sewn onto the hat edge. The outer long “tail” of the hat’s scarf edge gets horizontal tucks to sort of aid in gathering that “tail” into a large decorative buckle. I used a semi-vintage (1960’s or 1970’s era) plastic pearled buckle from hubby’s Grandmother’s stash of notions to provide a feminine and neutral colored touch to the hat. This hat was a very easy and quick two hour project. 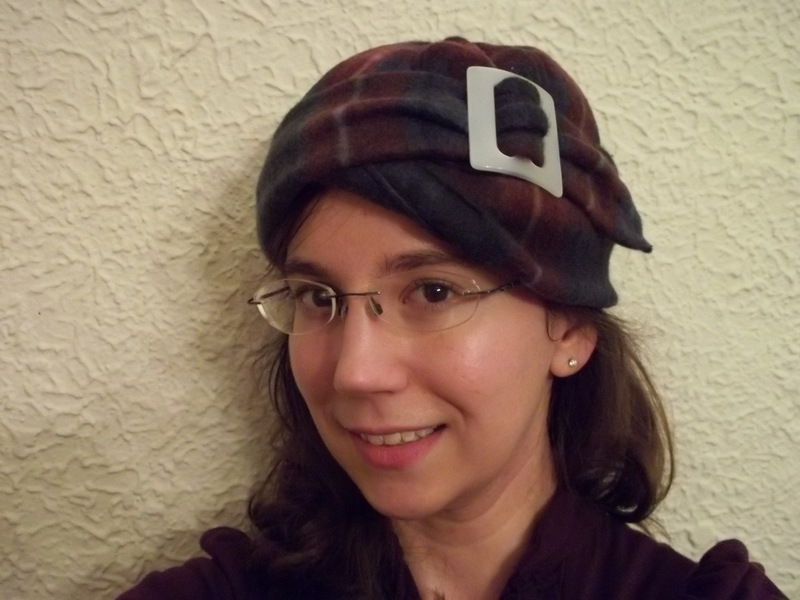 There wasn’t too much cost or any risk involved in making this hat, either, because it uses hardly any fabric and the fleece is stretchy enough to make the sizing forgiving. You could even use scraps to put together one of these type of hats, to make it even more sensible. Every so often an “instant satisfaction” project such as this hat is needed in my sewing – it keeps more complex creations from feeling like they’re so formidable. The “skull cap” base of the hat is made up of six small triangles which, I am proud to see, line up the plaid all the way around. Look closely at the center back of the scarf bottom to the hat and you will see that there are just a few horizontal tucks there as well. I think it provides a nice touch of detail and keeps the band gathered all the way around. I should get this hat out more often and wear it. 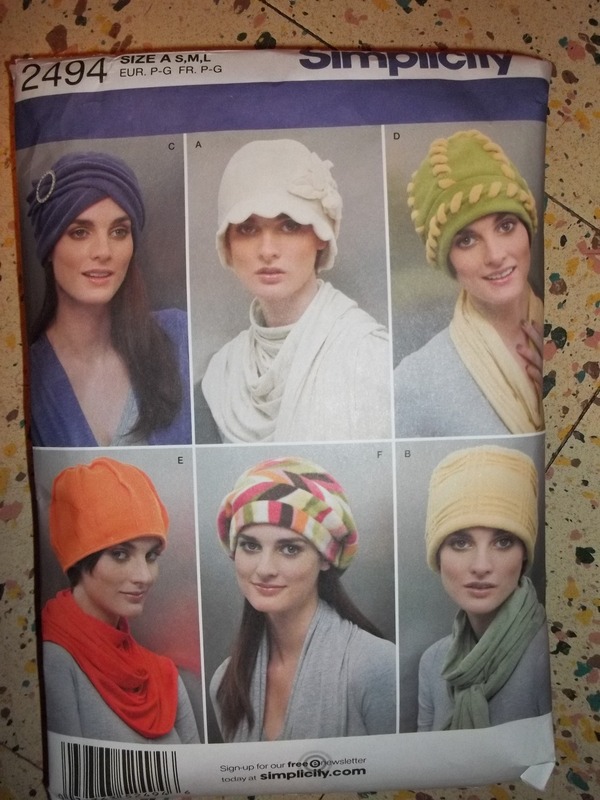 Come to think of it, my fleece hat can be stuffed in pocket or purse, it will keep my ears and head warm for sure, plus, it is an easy, fashionable fix for a bad hair day! NOTIONS: All I needed was thread for the hat’s construction. The buckle was on hand from hubby’s Grandmother’s stash. That buckle was missing it’s middle bar to be used as a regular belt closure, so it was perfect to be used decoratively. PATTERN: Simplicity 2494, view C, year 2009. 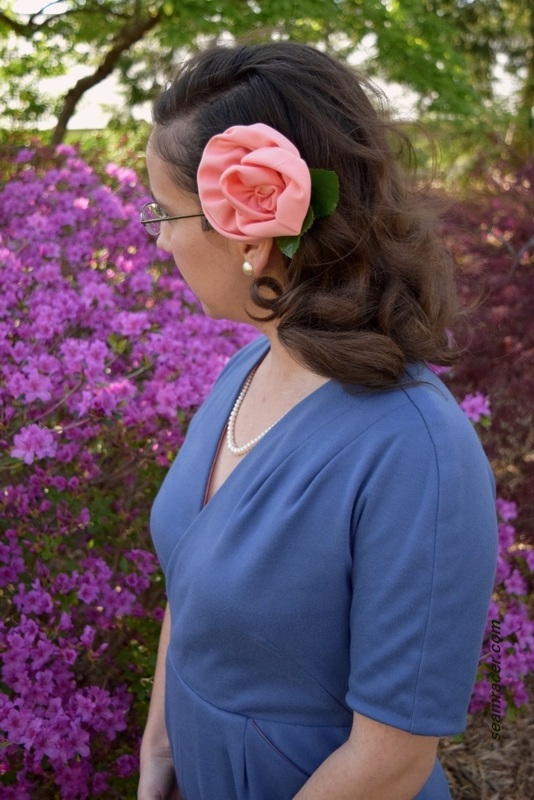 I would like to make the ivory version with the scalloped brim…so very 1920’s! TIME TO COMPLETE: Only two hours! It was both made and finished on December 12, 2012. Your answer will be negative, no doubt, because…neither have I, and there really doesn’t seem to be such a creature. Somehow or another, nevertheless, there is a sweater knit fabric of a silver speckled purple snakeskin tunic dress in my closet. Weird, right? O.K., I might have introduced this dress on the wrong ‘foot’ (ha ha, snakes don’t have feet…), but my garment really isn’t all that bad. 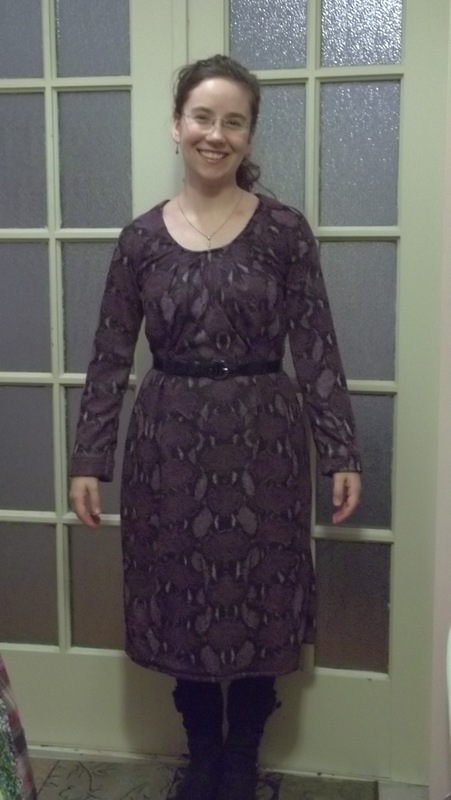 The snakeskin dress was completed 3 years ago when my adventures in blogging first began. Why it was made, I still don’t exactly know, nor can a final decision be made whether or not I like it on myself (…that’s still in limbo). My consciousness has a strong suspicion I only picked out: 1) the fabric because it is purple (I cannot resist that color and would live in it if I could) and, 2) the pattern because it looks modern, fun, easy, and comfy. 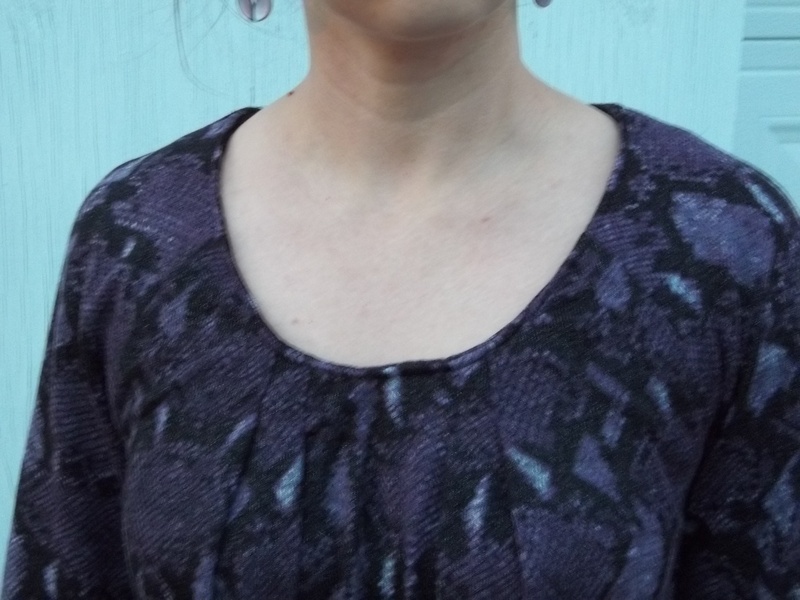 Simply on account of the fact that I do wear my purple snakeskin dress, I did make it, and as it is awfully warm and cozy, I will finally get around to blogging about it. FABRIC: A polyester/acyclic knit blend. It is a lofty, but lightweight sweater knit, with a silver speckled pebble finish over the snakeskin. The snakeskin knit is lined in a lightweight black polyester “active” knit to amp up the warmth factor and eliminate any see through issues. NOTIONS: I had all the thread and interfacing/hem tape that was needed. TIME TO COMPLETE: I don’t remember anymore – maybe one or two night’s worth of a few hours. It was finished on December 7, 2012. TOTAL COST: I don’t remember that either. All I know is that the fabric was bought from JoAnn’s Fabric store, and I probably spent no more than $15, but in all likelihood, less than $10. 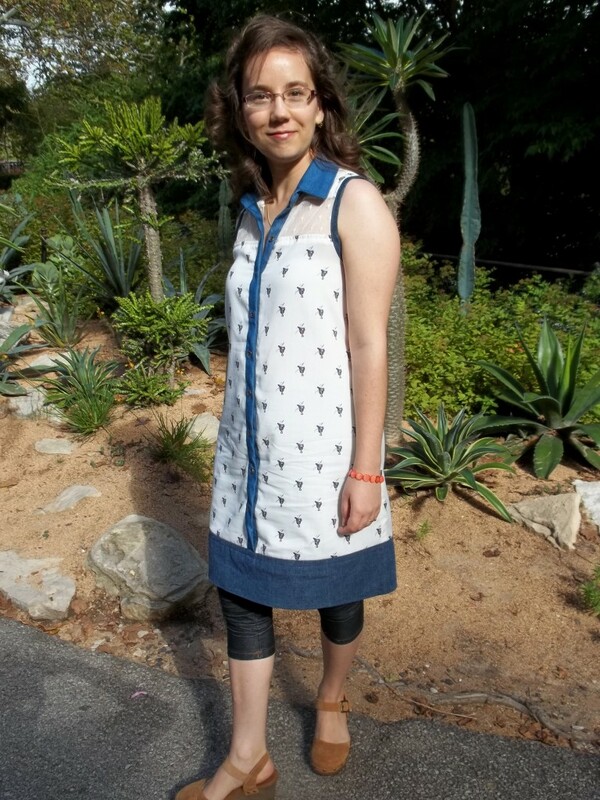 As you can see, the pattern I used is supposed to be a tunic, but I lengthened the bottom hem by about 8 inches to turn it into a dress as you see it. (I’ve done a tunic/top into dress change before; see this post) I am not really sure if I like this snakeskin knit as a dress, but at the same time I don’t know if I would like it (or wear it) as a tunic, either. Besides lengthening, the only other changes I made to the pattern are the additions of a few tucks to bring in the tunic at the waistline. There are three of these waistline tucks – a big one at the center back, and two off the center of the front. Anything to provide shaping and avoid making me fat! If you can’t see those tucks in our pictures, it’s because they get hidden under my belt. Actually, the tucks I added don’t look bad on the dress if a belt is not worn, and they can be very easily unpicked if I so decide. Besides the changes listed, nothing else was done to vary from the original pattern. I did find the sizing to run very generously…by that I mean very large! Technically I could have went down a size, or two even. It is always easier to take in a garment than it is to fit one that turns out too small, so I’m not really complaining about this pattern, just forewarning others. I don’t remember exactly, but I think I had to take in several inches, on each side, out of the dress all the way down the entire side seam, from the bottom hem up through the hem of the sleeves. I have a feeling that with a lightweight fabric like challis, the generous fit would be appropriate and look good with the design. 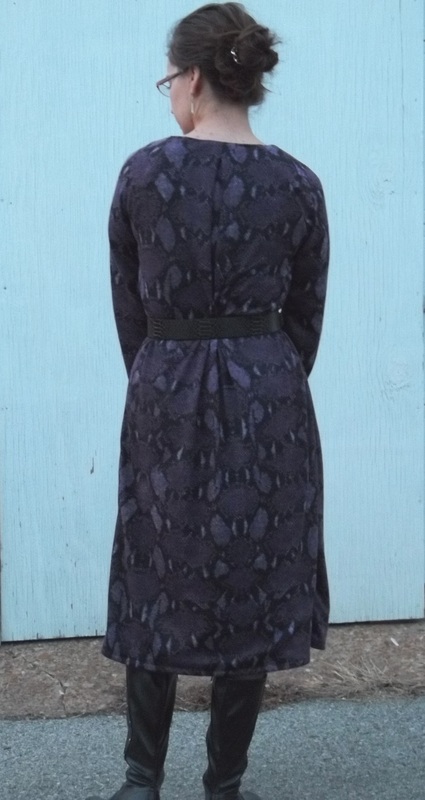 For the first winter I made this dress, I just left on the excess fabric in the side seam – why, I think ‘just in case’ I wanted to take the seam out. But, in winter #2 for my dress that excess was indeed cut off and cleaned up, trimming down on the dress’ bulk considerably. For being a knit pullover tunic dress, you do need to stabilize the neckline to support keep the large scoop neck from losing its shape and, in my case, support the rest of the dress. I guess I could have omitted interfacing the facing since I also sewed in, well, I hate to admit it…hem tape…into the neckline to stabilize it. Talk about overkill! 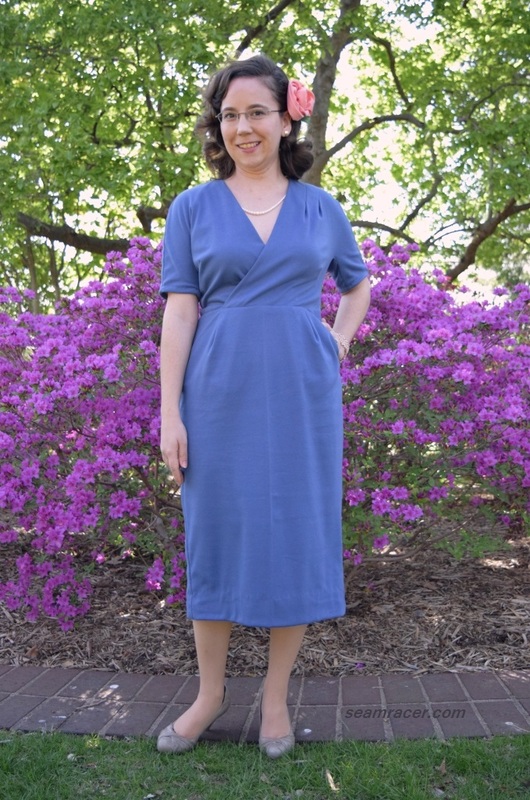 As I said earlier, I had made this dress when I was just getting back into sewing full swing, and as of yet, did not have a whole lot of experience with knits nor did I know in entirety what was available at the fabric stores. 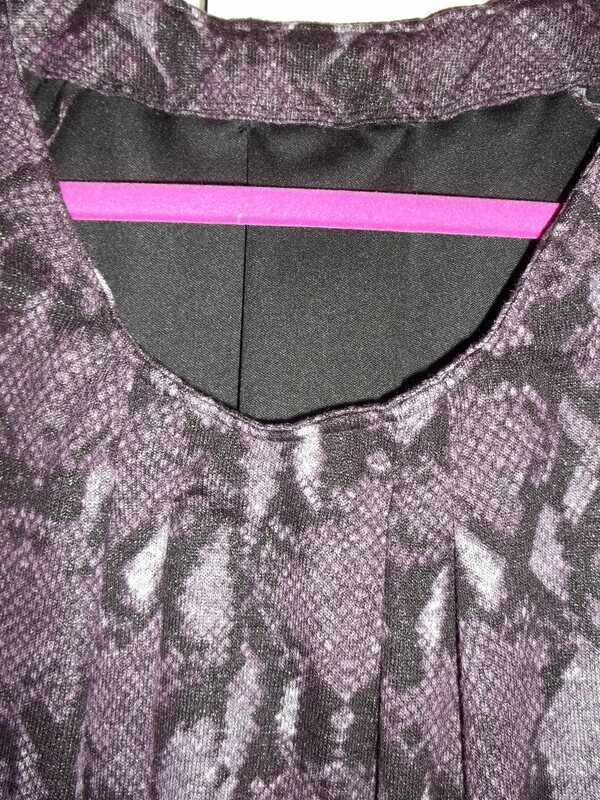 I should have sewn in seam stay tape into the neckline. The hem tape did do the job just fine, beyond adding a bit more bulk than was needed (and it was significantly thick already from the two fabrics and the neckline pleats). Bad girl, I didn’t even sew this dress together in a proper knit manner. I used loose straight stitches, which still work decently, instead of zig-zag stitches which ‘give’ with the knit. One tremendously good thing about this dress is the fact that it makes me realize that my sewing skills have significantly improved. My snakeskin tunic dress was an easy and quick gratifying project to learn off of and also wear when the mood strikes me. This is a very warm item to have on when the temperatures drop, even despite its open scoop neck. A thick and chunky scarf can fix the open neck ‘problem’. As much as I like the cowl/loose turtle neck option on the pattern’s other views (see picture earlier), I like the open neck. I think it helps keep this dress from looking too overpowering, and besides, it keeps me being too confined and overheated in a dress this cozy. To make my outfit more complete, I like to wear my dress with a grey snakeskin belt which was bought from my favorite (now closed) resale store. As a disclaimer, my belt is printed vinyl, not the real reptile product, but it sure looks more like the real thing than my dress’ fabric does – purple, silver speckled snakeskin, really! Kim at the blog “Kopy Kat Kim” made a wonderful version of this same pattern in a red snakeskin. (Her tunic is indeed styled beautifully and looks amazing!) Furthermore, I found an interesting page which briefly runs through snakeskin fabric in fashion history. That page can be found here. On the humorous line, when I say or think the two words, “purple snakeskin”, I can’t help but think of a silly song that always made me laugh as a little girl: “One Eyed, One Horned Flying Purple People Eater”, dating to 1958, believe it or not. Having something so scary be a funny color lightens things up, making them funny instead of fearful. Maybe there is a purple snake that is a distant relative of the “one eyed, one horned flying purple people eater”? Silly me! When I joined the online sewing circle of Sew Weekly in mid-year 2012, I didn’t realize then that I was embarking on a tremendous challenge. Sewing every week, pushing one’s limit’s, teaching one’s self new skills by accomplishment, and becoming 99% independent of all “ready-to-wear” (RTW) garments has been a very informative move that changes one’s outlook and knowledge in ways never expected. Beginning my counting after my first blog posting, here it is exactly two years later that I have reached the number one hundred project! Ya hoo! 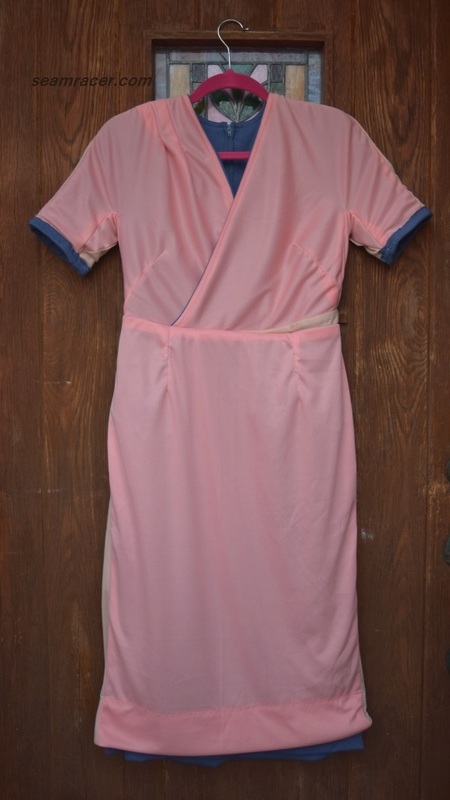 This post is a combination of my quiet, unofficial celebration of my sewing feat and a project post on the garment that brought me to my century of ‘me-made’ items. 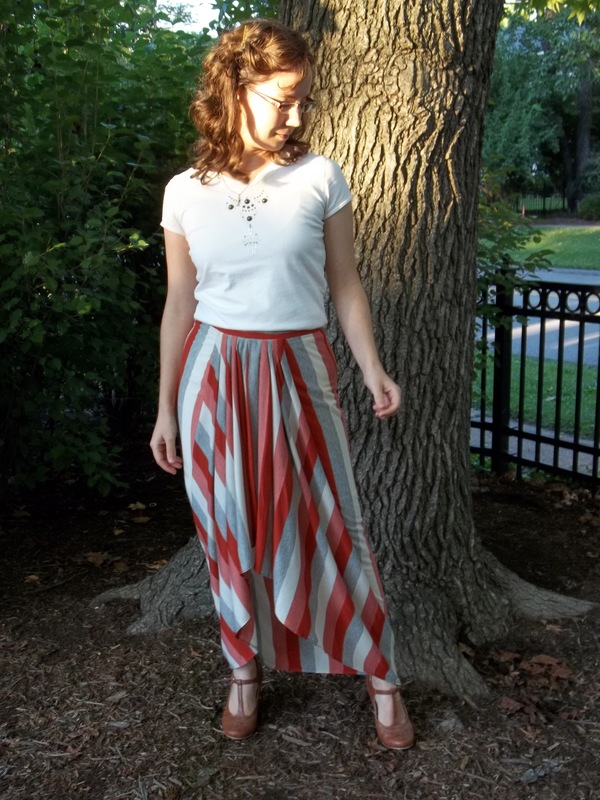 An unusual skirt with some neat fabric and the most current modern fashion is my #100 project. FABRIC: a lightweight to medium weight rayon jersey knit, with a small percent of ‘Modal’ (a newer rayon-type) in its content, with the colors of ivory, grey, and rust orange. TIME TO COMPLETE: This pattern took me only 5 hours from start to finish. It was done on September 12, 2014. THE INSIDES: the two side seams are in French seams, and the bottom is in a tiny 1/4 inch hem. This skirt pattern really impressed me. It has a quality that I don’t find too much of in modern patterns, maybe only Vogue Company if anything. The skirt’s design has a beautifully simple complexity, one which makes the construction very fun and happily intriguing to the mind (at least to mine). 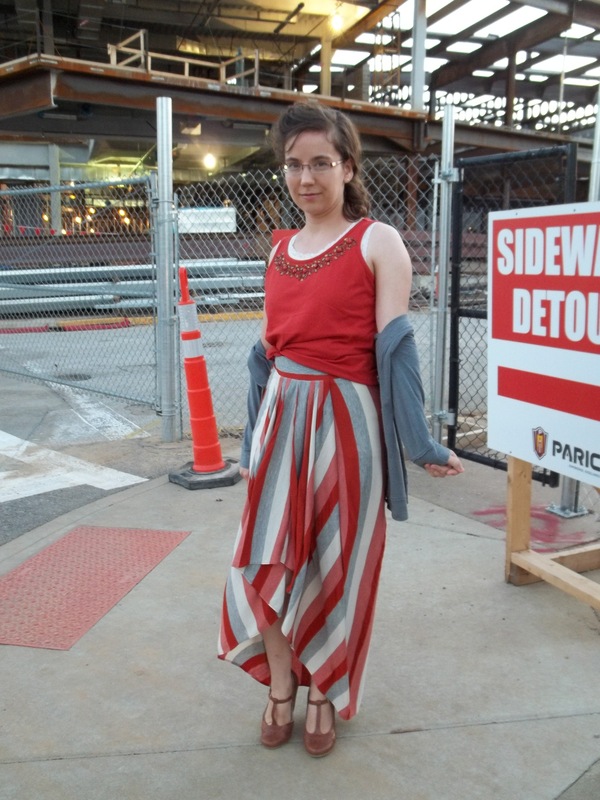 Would you believe here are only three pattern pieces to make a skirt like this? 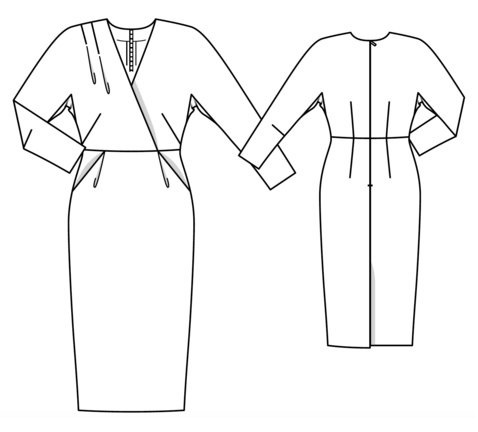 There is a waistband, the skirt back (cut on the fold), and the skirt front (cutting two). All you need to know is how to do pleats and darts. I know ‘hi-low hem’ skirts are not for everyone, but you must admit this skirt is unique and I like it that way. The way I see it, if you’re going to make something, make it so much better and special than anything available to buy RTW. Even though I can’t say enough good things about Simplicity 1429, I must vocalize a BIG complaint about the cutting layout instructions: they are completely wrong!!! Following the layout the instructions show, one would cut out the back skirt panel with the stripes going horizontal (instead of vertical like the front sides of the skirt) – very big, very ugly boo boo! Also, the total amount of fabric needed would be a ridiculous amount more over and above the 3-something yards already called for on the envelope back chart. Lucky for me, my mind was actually working so as to notice what was wrong. I have never yet seen a cutting layout mistake this big and obvious. Normally, any problems I do find in new patterns only have to do with construction details. 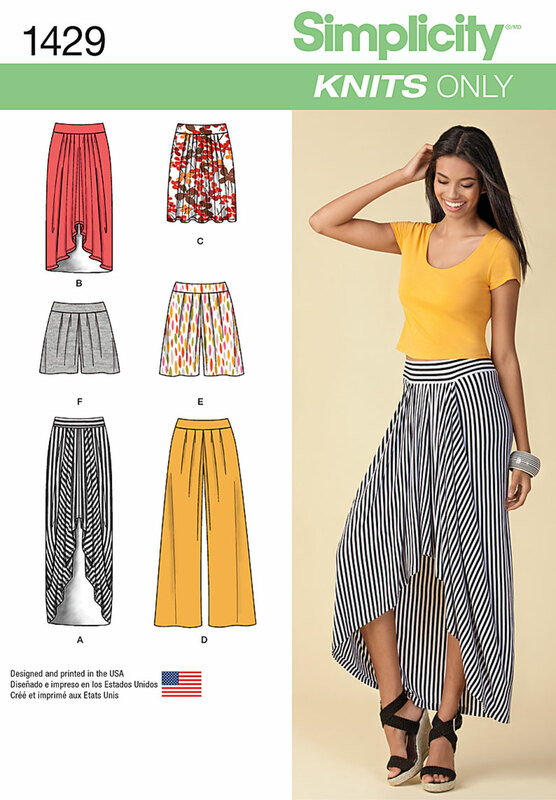 I can totally see someone, myself included, just going along with the layout, and trusting the diagram to be right because, hey, this skirt does look like it calls for some unusual things to be done. I have done mistakes like this before, and they are usually repairable, learning experiences. 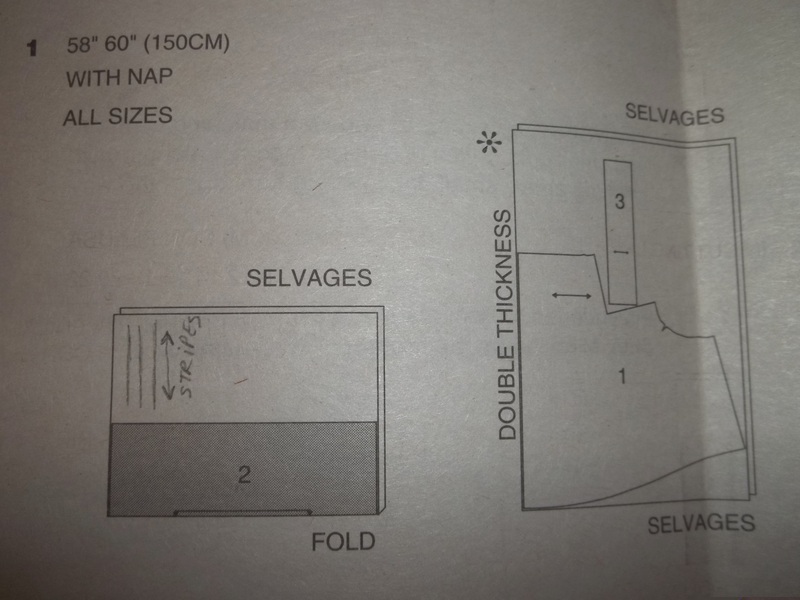 However, Simplicity 1429 cutting layout mistake is not cool – it makes for a complete waste of fabric, wastes money, and is not repairable unless you want (or can) buy more fabric. 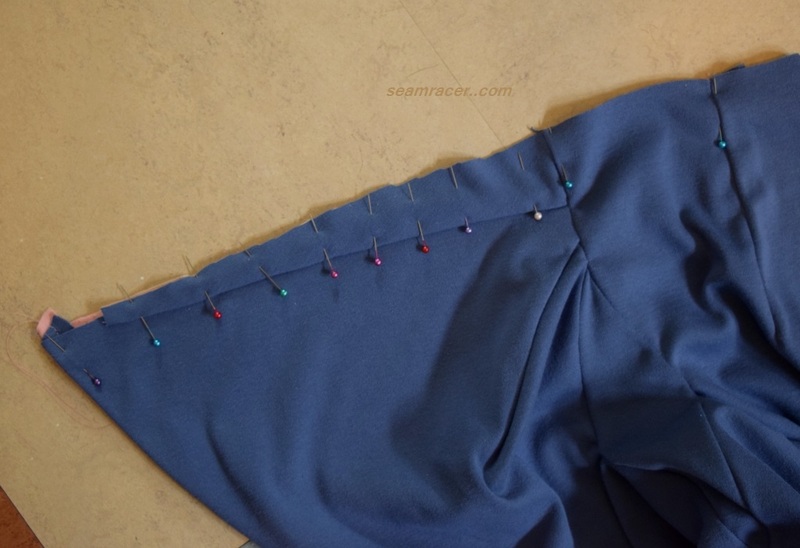 Mistakes come easily enough in the experience of sewing without having to be tripped up at the very beginning of a project by a faulty fabric layout diagram. Unfortunate sewing times shouldn’t come to anyone, and turn people away…the world needs all the interest possible in the fabric arts, so nothing gets lost. It’s easy to avoid this cutting layout mistake. At right you can see my own layout diagram drawing. Start with the back skirt panel. It looks like a very long and very skinny pattern piece – kinda strange! Open up the fabric completely, single layer. Next, take the one end of the cut edge and fold it into the rest of the fabric with selvedge to selvedge. Don’t fold in too much, though – just enough for the back skirt pattern piece’s width because you’ll need most all of the fabric for the front skirt piece. 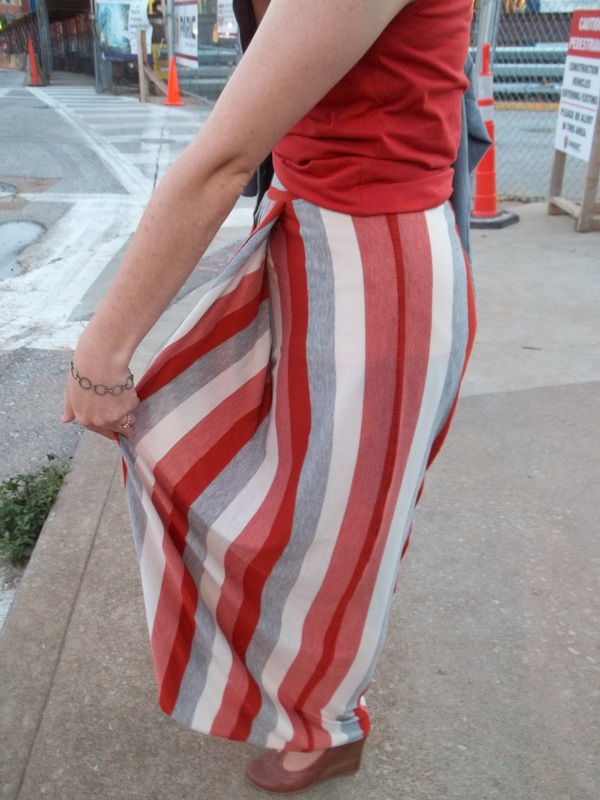 Now the back skirt piece should run vertical along with the stripes in your fabric. 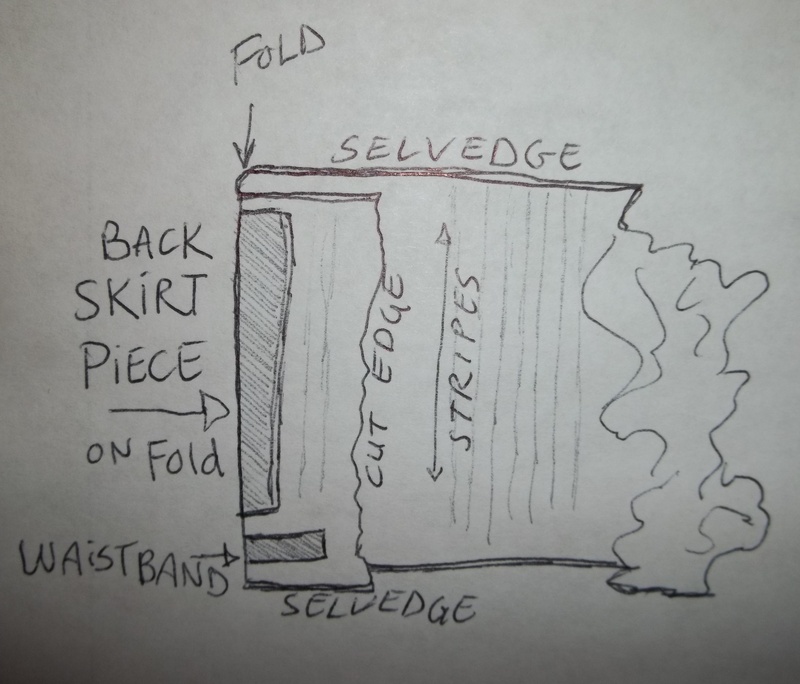 Lay the ‘on fold’ edge of the skirt piece on the fold like my drawing shows. You should be able to fit the waistband at the bottom fold, too, by folding the pattern piece in half, but you don’t have to do it this way. I just always like to make sure I have enough room for a small but important piece like a waistband by cutting it out sooner than later. Finally, the large and strange shaped front skirt piece can be cut out as directed, double layered, with stripes matching. The front panel pattern piece gets cut double layered, with fabric selvedge to selvedge, and there is a LOT of marking needed so expect to take plenty of time and space floor (or table) space for a successfully finished skirt. The time you take to do all those markings is so very important with the front skirt pieces, even though it is hard on account of the need to match two layers and the fact that knit does not hold chalk very well. I did the ‘tailor’s tacks’ style of markings with thread and, even then, had to keep out the front pattern piece and instructions to make sure I was matching the right sections plus turning them the right way. Marking is the only hard part to this skirt, in my opinion, because the rest of the skirt (even the front) comes together easy-peasy as long as the construction instructions are followed. No matter how strange the construction seems, just follow it, and as you do, it all makes sense because you see it suddenly looking like it should before you know it. 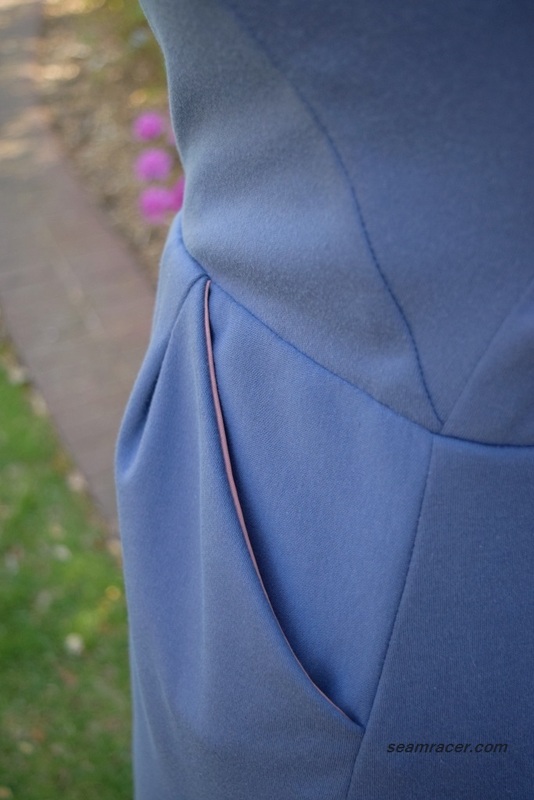 You dive right into doing all the front pleats, which get hidden by being taken into the folds. The “pocket” over the belly created by all that fabric manipulation in the front is sewn together in a lapped seam inside, pulling the fit taught around the hips and waist (see below picture). There is a very wide, basic casing sewn at the waist, to have very wide 1 1/2 wide ‘non-roll’ waistband elastic installed through. I only wish I would have made the waistband casing double layered to help support the rest of the skirt, but sewing in the waistband at the front was thick enough the way it was, I’m not sure my ‘improvement’ idea would even work. I am very glad I switched between sizes for my skirt. I noticed the model’s skirt on the cover envelope seemed very tight, plus I figured correctly that the skirt would be quite disproportionately heavy at the front. Thus, I went down a size for the waistband, and up a size for the skirt sections, and, because you’re working with a knit, everything stretches to fit together to match up well. The skirt seems to fit me perfectly. It turns out snug enough the way it is, even with my going between sizes…it would have fit like a second skin according to the pattern – yuck! Some amount of form fitting is appropriate to maintain this skirt’s proper styling and hot, figure flattering appearance. This garment gives me something I don’t normally have – the feeling of being very tall! I am on the average/almost petite height, and I kind of like the fact that merely wearing this skirt, with it’s vertical form skimming lines, makes me feel otherwise. The high/low hem and the draping causes a sort of peek-a-boo effect with the bottom half of the legs when walking, creating a very complimentary effect to a lady’s gams especially when worn with heeled shoes. If you have a booty, this skirt that part of your body a positive focus, too. I found my new skirt a bit hard to accessorize, in the way of finding the right top, shoes, and/or sweater to wear. Any top worn with the skirt has to be just as tight as the skirt because there isn’t much room for anything blowsy to be tucked in at the waist. 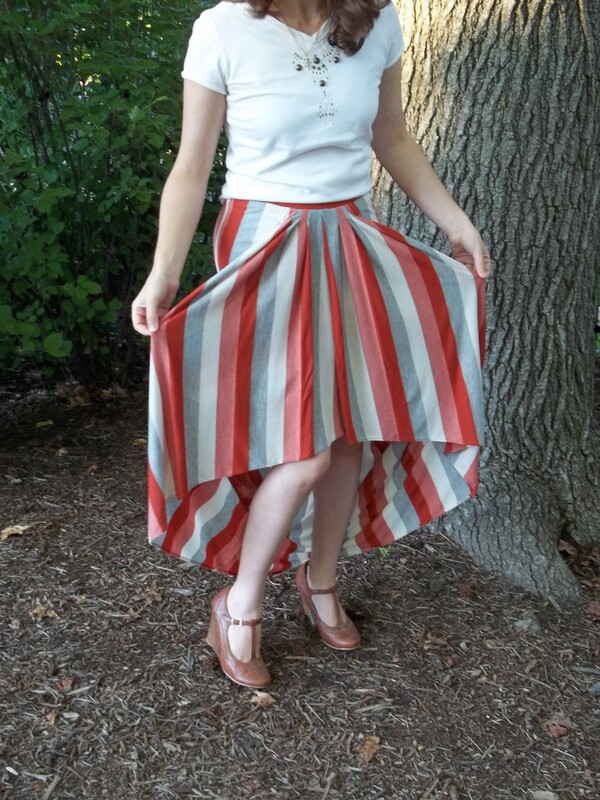 On account of the bulky, pleated skirt front, I think any top worn with this skirt needs to be tucked in, which is another limiting factor…unless you have the gumption to wear a belly top 🙂 I think I found a few ways to outfit my striped skirt, and you see two in this post: 1.) my ivory short sleeve tee with studs and sequins, and 2.) my rust orange jeweled neckline tank top, layered with a tank underneath and grey long sweater. Outfit #2 seemed to need a raw and modern backdrop so we tried out exploring a construction site (see below right picture). I love how the skirt’s appearance moves and changes as the wind blows and as I move. When the four bias drapes hang just right, it is truly amazingly picture perfect. Perhaps I’m just so happy with my new unusual skirt because it brought me to my ‘project #100’ in exactly two years!!! 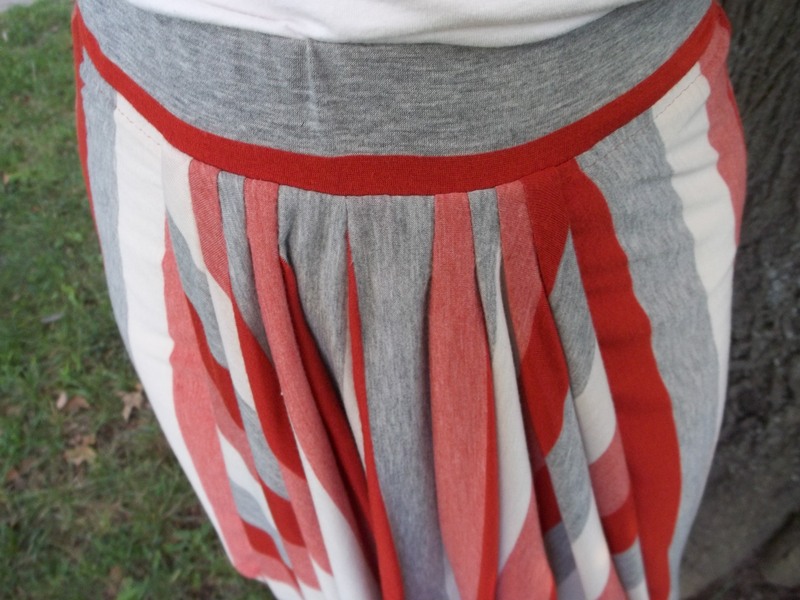 Check my Flickr page for more upcoming pictures of this draped, unusual, and special skirt. Happy Sewing!